University of Oregon Pro Day has commenced, and the numbers are in. Marcus Mariota lit up the field as he was seen taking snaps under center for the first time in a meaningful situation, Arik Armstead decided not to run the 40, and Jake Fisher further proved why he should be considered a first round draft pick. 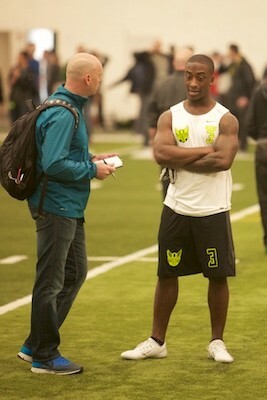 Dior Mathis after his Pro Day performance. Because Dior Mathis is an undersized, underplayed Senior, many people will overlook his numbers. Did you know that Mathis ran a 4.2 second 40 yard dash? Yes, it was unofficial, but WOW! Mathis has never been considered a standout player. 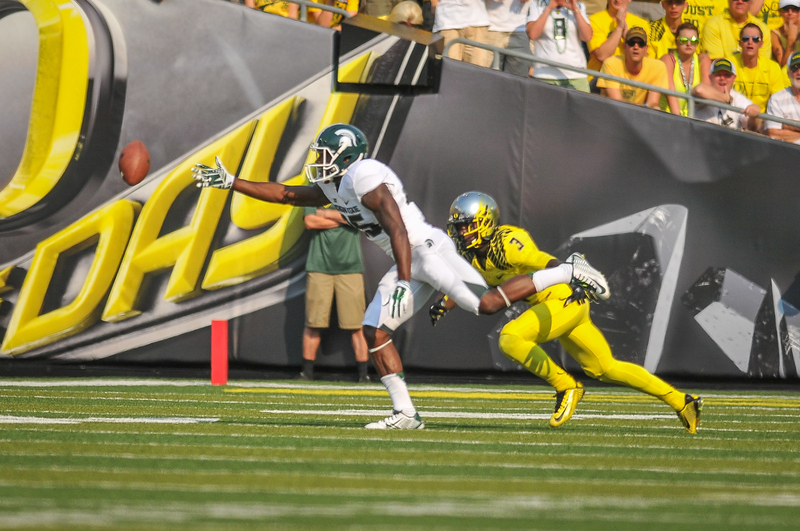 What Ifo Ekpre-Olomu lacks in size, he makes up for in shear talent. Mathis lacks size, and showed flashes of greatness, but was never able to put it together. In his career at Oregon, he recorded 55 tackles and 3 interceptions, according to sports-reference.com. Mathis was not invited to the NFL Combine, and has never been considered one to get drafted come late April. Running a 4.2, however, might get scouts to look at him. 4.5 is fast, 4.4 is elite, 4.3 is insane – 4.2. is unheard of. Mathis could end up floating around the NFL as an undrafted rookie looking for a special teams unit that needs a speedster. Whatever ends up happening, FishDuck.com wishes Mathis the best in his future endeavors. And for your viewing pleasure, enjoy watching Mathis and De’Anthony Thomas team up to obliterate the field in the 4×100 meter relay.